No matter the terrain or season of the year, LUVERNE Baja Steps are designed and built to conquer the trail. These rugged side steps not only feature an off-road styling, but they are constructed to be a superior off-road accessory. With large, non-skid drop-down steps, 1/2" circular treads and a no-drill vehicle-specific fit, these steps were born to go off-roading. Best of all, Baja Steps feature a durable powder-coated finish and stainless steel construction to be completely rust-free wherever the trail takes you. The unique look and function of Baja Steps comes from their patented drop-down step design. The steps are specially made for off-roading, featuring a 3 1/2" x 12" stepping surface that is low enough to provide a comfortable step up, but elevated enough to clear rocks, logs and other off-road obstacles. Luverne took the off-roading concept a step further by constructing Baja Steps from stainless steel and covering them in a black powder coat finish. This textured black powder coat not only adds a professional look but also maximizes rust resistance. Baja Steps are also available in polished stainless steel. The drop-down steps of LUVERNE Baja Steps are covered in 1/2" diameter, protruded holes that not only grip the bottom of your boots, but also allow dirt and debris to easily pass through. This keeps the step clean and ready for your next off-road excursion. 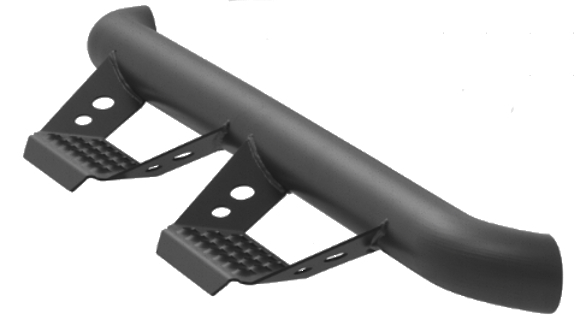 Each LUVERNE Baja Stes side step is made vehicle-specific for a custom fit on your own unique truck, Jeep or SUV. 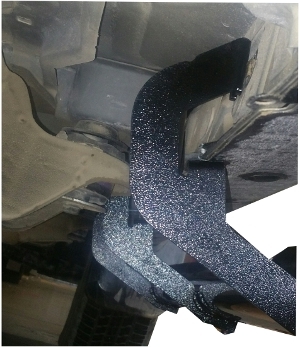 The off-road-ready drop-downs are welded onto a 3" diameter, 10-gauge tube that bolts directly onto your vehicle's frame, using vehicle-specific brackets.